All the latest headlines from the newspapers in Italy as the Scudetto battle re-commences this weekend with both Juventus and Roma hoping to pick up from where they left off. – Roma and Juve, the secrets of a challenge that resumes. – Giallorossi at Empoli and Bianconeri at home with Udinese size each other up at a distance. – After a good debut, Rudi Garcia and Massimiliano Allegri wonder who will be in better shape after the break? – Francesco Totti on the bench, Carlos Tevez in doubt and Kingsley Coman is ready. – Berlushow. Classic Friday visit to Milanello for the President to motivate the players. – Adriano Galliani: ‘He has the same enthusiasm as the start’. – Inter and the baby Sassuolo gang. – Sansone: ‘I want the Azzurri like Zaza’. – Carlo Tavecchio launches the new Serie A: 18 teams from 2017. – Squads will be 25 players, including eight from youth academies. – Serie B would remain at 20 teams. – Intense play or violent? Madrid divided on Simeone. – Empoli-Roma: Garcia pushes the Champions League out of his mind. – Mattia Destro seeks a relaunch, on Wednesday they face CSKA. – Juventus-Udinese: Allegri wipes out controversy on injuries. – Tevez is fine, Malmo fly in on Tuesday. – Serie A, in three years there will be 18 teams. – Tavecchio confirms the plan, no from Lega Pro for a reduction. – Berlusconi fires up the Milanisti. – Hamsik sure: ‘Napoli can win the Scudetto’. – Madrid Derby, Simeone thinks of Cerci. – Serie B: Bologna surprise 3-2 at Pescara. – What a sparkling Juve. – Agnelli: ‘I hope next year Juve can win the Champions League and Ferrari the F1 title’. – Allegri: ‘There is no injury crisis, people are creating stories out of nothing’. – Conte thinks of Miño! – Italy Coach visits Toro and the ‘Italian’ Argentine can follow Camoranesi’s path. – Here’s Berlusconi: ‘Milan, I’ll be there against Juve’. 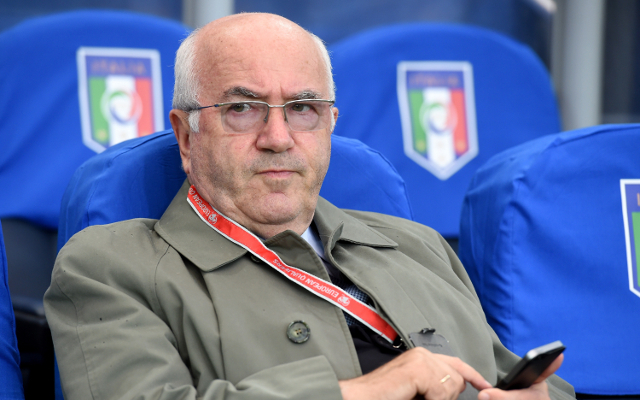 – Tavecchio swears: ‘All the reforms complete within three seasons’. – Balotelli discovers the Liverpool legend.